Our lovely apartment is on the 5th floor and pretty much in the center of anywhere we need to go. There are 2 grocery stores within a 5 minute walk and bus stops on either side of the building. After reading how many apartment rentals are up the hillside from old town, with hundreds of steps to reach, we are pretty happy that we are near the port and have mostly a flat walk to the places we want to visit. The day after our arrival it poured rain all day so it gave us a chance to hang out at home and make plans how to spend our time here. 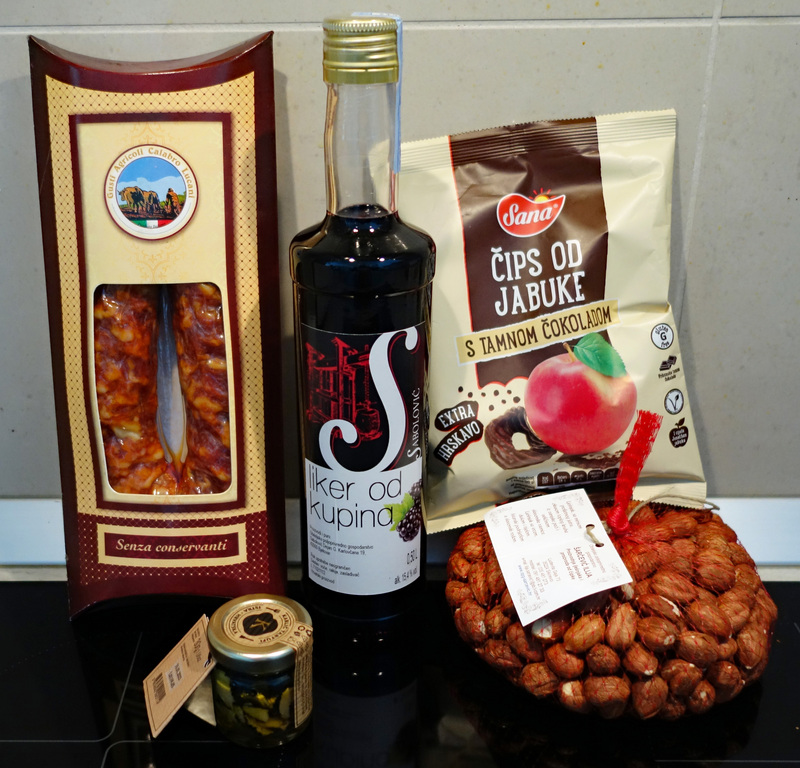 It was fun talking to the vendors about their products and gaining a little understanding of what items are popular in Croatia and where they are made. While there we sampled a traditional Croatian dish, Soparnik. It is a type of thin flatbread with two layers of dough filled with chard and onions baked over a fire. Here is a link to a more detailed explanation of this local favorite, which was quite delicious. After our time at the fair, and with a full backpack, we wandered around the Babin Kuk area, filled with 5 star hotels and resorts all along the western coastline. Being March most places were closed and we found only 3 restaurants open this time of year. One place we called said they open May 1st, which I assume is when their season starts. 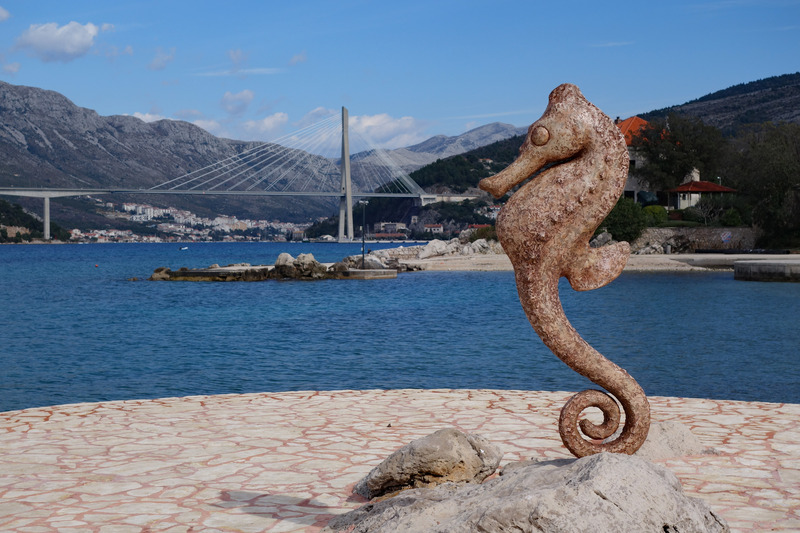 Lucky for us we had a quiet walk around the area enjoying stunning views of the coastline and out to the Adriatic Sea. Being by the sea is no doubt my happy place 🙂 We continued our walk around to the northern side of Babin Kuk down to the Copacabana Beach, the buildings are all boarded up at this time of year. We had lovely views across the water to the Franjo Tudman bridge built in 2002. Continuing on we passed by the new Yacht Club and into the Port of Gruz where the multitude of cruise ships will arrive during busy season, and finally back to our apartment just one block from the port. 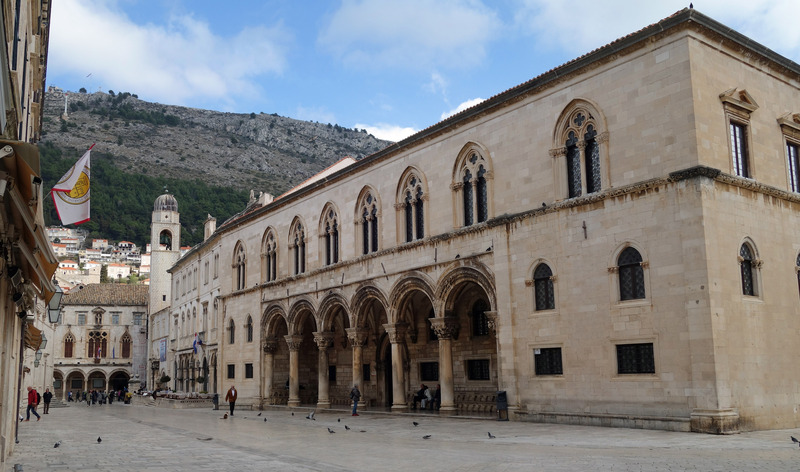 Every Saturday the Dubrovnik Tourist Board offers a free walking tour of the old city which you can sign up for online. 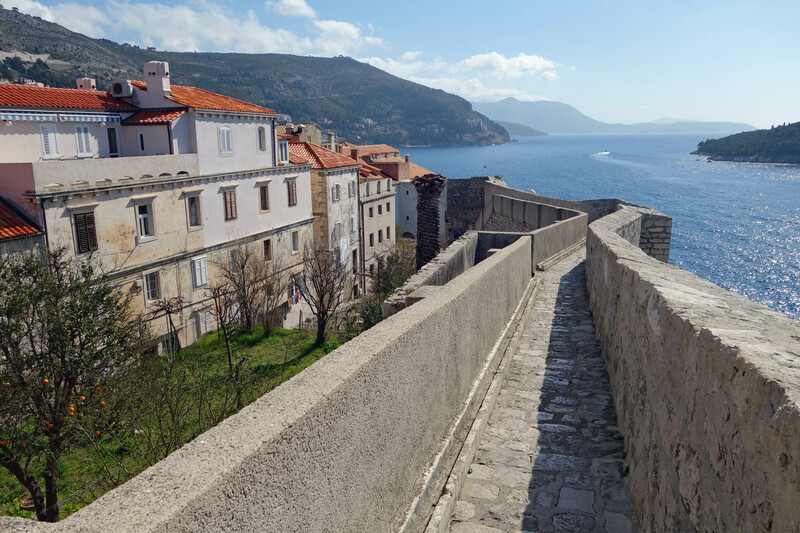 It was our first foray into the walled old city of Dubrovnik. Our tour guide unfortunately chose loud places to stop and then spoke very quietly so we missed a lot of what she was saying. The tour finished in front of St Blaise Church where a performance of traditional Croatian dancing and music was happening. It was a nice way to finish off our brief walk around the old city and has given us ideas of how to spend a couple of days walking around here. Before our walking tour began we stopped at the Tourist Information office to pick up our 7 Day Dubrovnik Card which we purchased online to get a 10% discount. The cost of the card was 315 Kunas (48.45 USD) each which is a little expensive but considering the wall walk ticket alone is 200 Kunas (30.75 USD) it seemed worth the extra to get access to a number of museums, 10 local bus tickets, plus tickets to Cavtat, a town south of Dubrovnik. It will give us the incentive to see more sights than we may have if paying numerous entry fees. For most holiday travelers this is not a large expense, however when traveling full time it would be easy to spend over 150 Euros a day on entrance tickets in some places so we need to choose carefully what attractions most interest us. 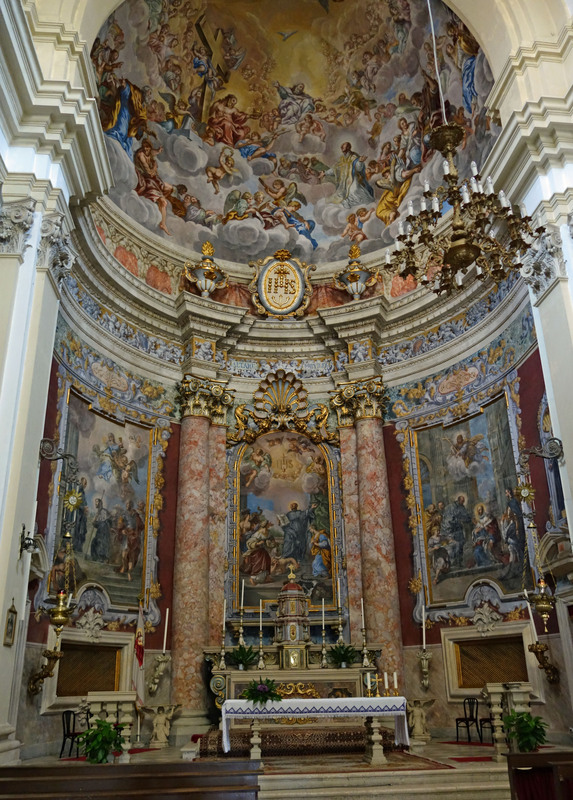 St Blaise is the patron saint of Dubrovnik and you will find him everywhere, on ships flags and coins, and on every important building in Dubrovnik. He is anchored into the exterior of the walls around the old city, above the gates to the old city and standing tall on a church in his name. 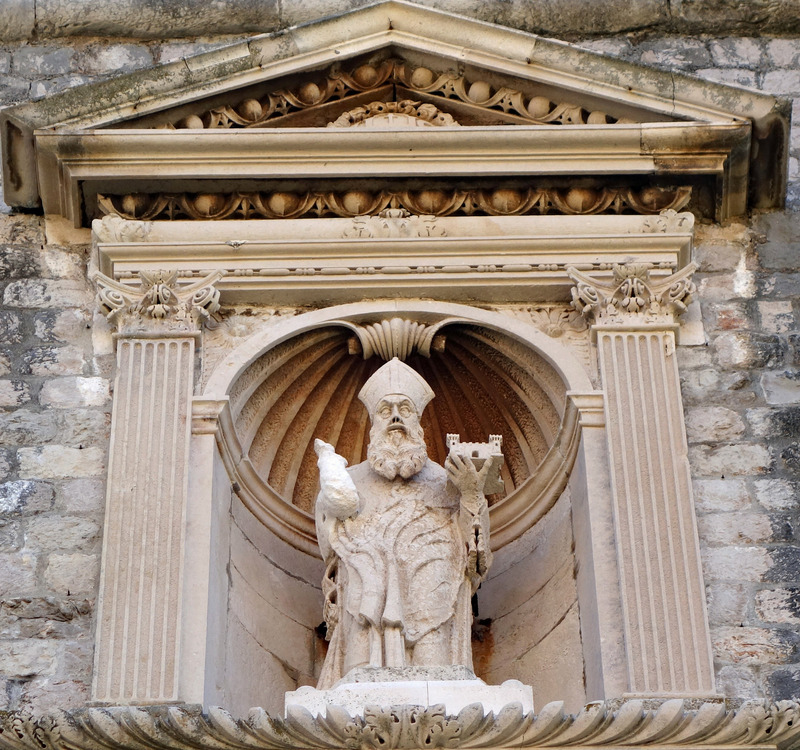 St Blaise, patron Saint of Dubrovnik, above the Pile Gate. The lovely and elegant Baroque stairs leading up to the Jesuit church were designed by Italian architect Pietro Passalacqua and are similar to the well known Spanish Steps in Rome. 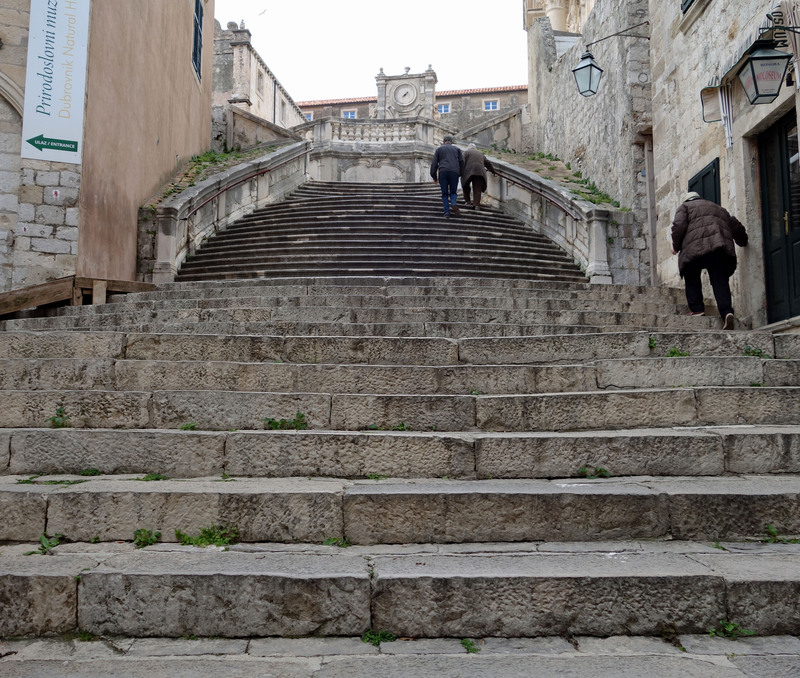 These stairs have become more famous recently as a filming location for Game of Thrones. 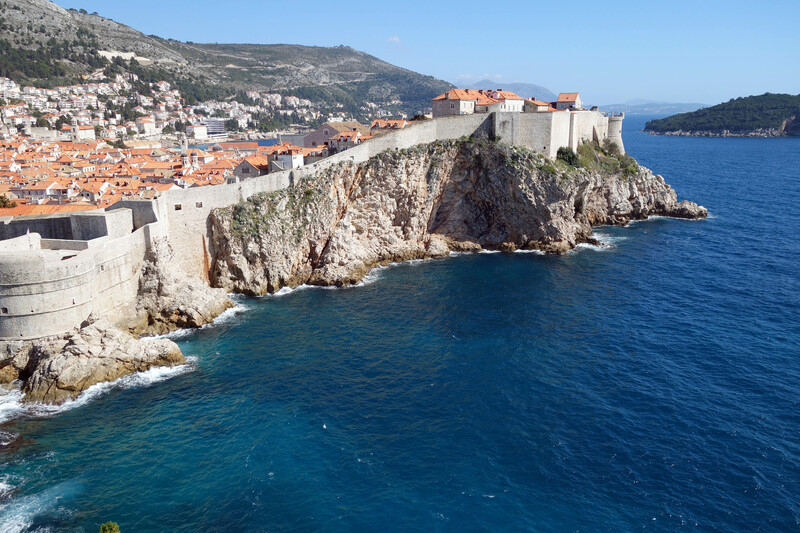 The biggest attraction is Dubrovnik is without a doubt “walking the walls” of the old city. The wall is 1,940 meters long with 6 fortresses, among the largest and most complete in Europe. We chose a sunny day, arrived early to beat any potential crowds and took a leisurely 2 hour walk along the wall high above the old town of Dubrovnik. The views are magnificent all the way whether admiring the old city, gazing out to sea or watching the waves crash against the shoreline. The walls are open from 9am-3pm in off season and were reasonably quiet during our walk. The walk route is one way which did not really matter while we were there but I can imagine it would be impossible having people going both ways in busy season with many sections of the wall only wide enough for one person. 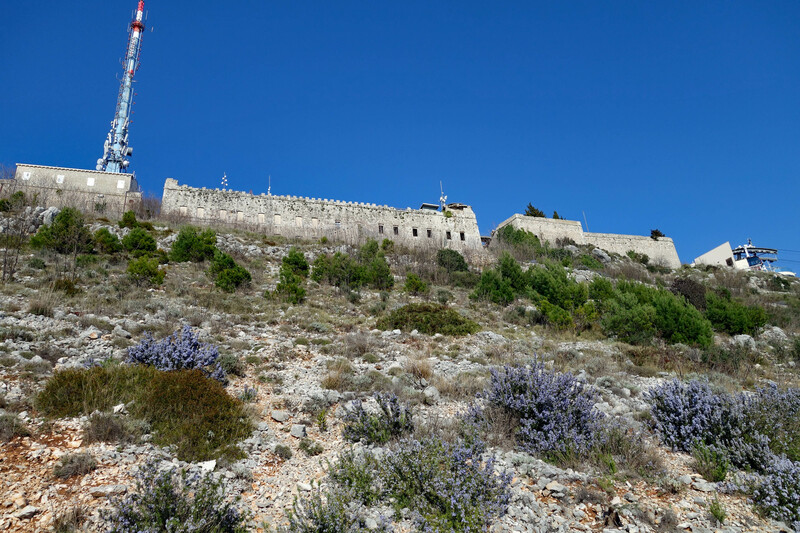 Your ticket for the wall includes access to Fort Lovrijenac, a fortress outside the western wall of Dubrovnic Old City built on a 37 meter high sheer rock. This detached fortress was of prime importance for the defense of the western part of Dubrovnik. The walls on the seaside are up to 12 meters thick!! This fort was used as the Red Keep in Game of Thrones and is a popular location for tours related to the series, we saw guides with photographs identifying specific scene locations from the shows. One rainy day we took the bus into old town and toured 2 museums which were included in our Dubrovnik Card. 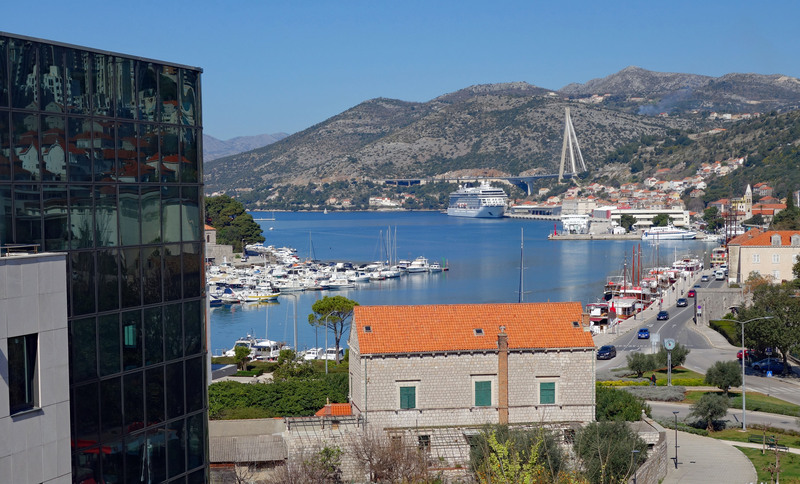 Firstly was the Maritime Museum which detailed the impact Dubrovnik had on seafaring trade and shipbuilding which led to them to being an important port and contributing to the growth of the city over the centuries. Secondly we toured the Rectors Palace. The rector was a senior government official holding the post for only one month, and confined to the palace for the duration of his term. This was where they lived and conducted official business, in addition to housing the prison. Seems like a strange place for a prison, under a palace!! One sunny afternoon we took the cable car from Old Town Dubrovnik to Mount Srd where Fort Imperial is located. We bought a one way ticket – UP – for 85 Kunas each (13 USD) with plans to walk down the mountainside taking in the magnificent views along the way. The views from the top are spectacular and continue so until reaching the tree line on the hike down. The trail down is not steep but has very loose rocks making it a bit challenging with the end of the trial coming out onto the highway. It would not be an easy trail head to find for the hike up!!! 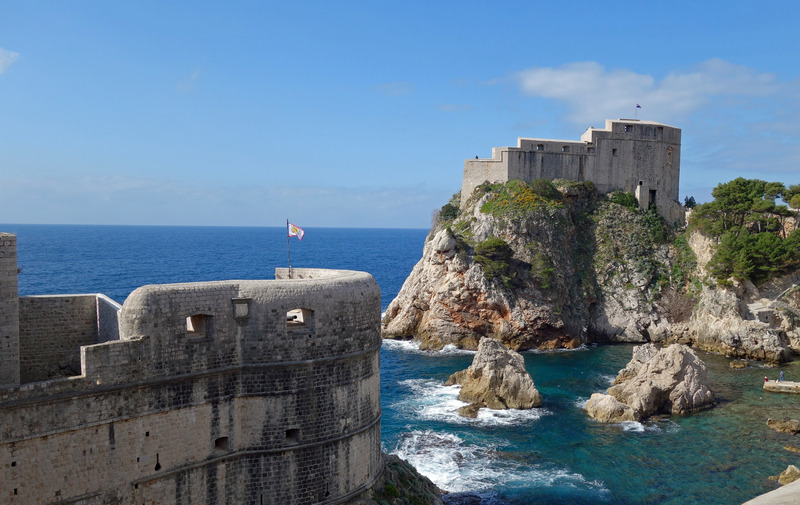 Fort Imperial was built in 1806 and currently houses the Croatia Homeland War Museum dedicated to the devastating 1991-1992 war when Dubrovnik came under heavy fire after the breakup of the former Yugoslavia. The ticket cost was 30 Kunas each (4.60 USD) to see the memorabilia, photographs and videos with news reports from that awful time. It is hard to fathom what the local people endured, and still feel to this day. 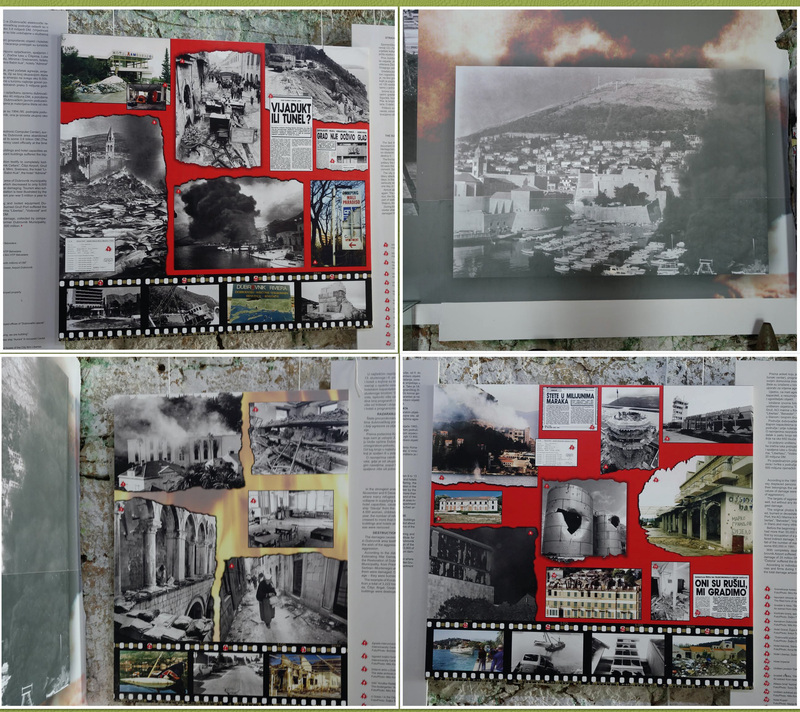 Fortunately international funding was provided to rebuild the UNESCO buildings destroyed during the war and Dubrovnik today is once again a popular tourist destination. Not having a car is a new travel experience for us and we have enjoyed taking the local transit around Dubrovnik. 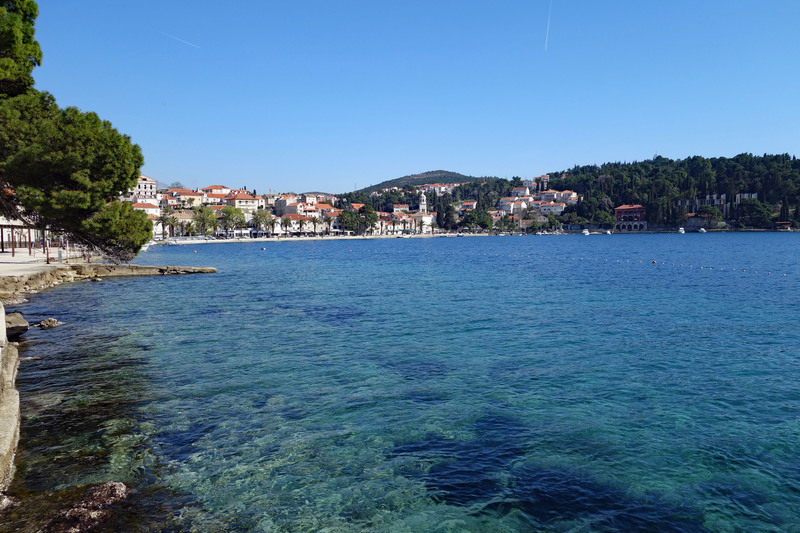 We took a bus ride out to Mokosica one morning, just to see outside the city, and then changed to an urban bus destined for Cavtat, 40 minutes south of Dubrovnik. The bus ticket to Cavtat was included in our 7 Day Dubrovnik Card. We had a lovely lunch overlooking the water followed by a walk along the water side pathway around the small peninsula jutting into the sea. Not much was open in Cavtat and none of the tourist boats were in the water yet. We enjoyed our visit to this quaint beach town with their busy tourist season not beginning until May 1st. We have enjoyed our time in Dubrovnik, possibly Croatia’s most well known and most expensive destination, and are feeling very happy that we are here in off season. 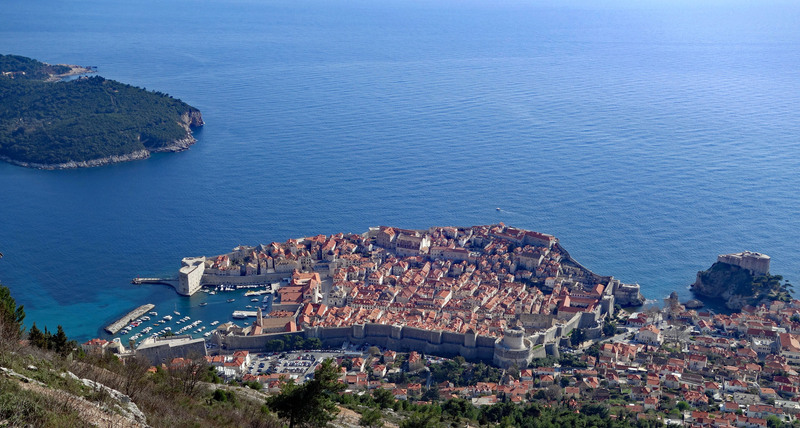 With a population of approx 50,000 Dubrovnik is the size of city we prefer visiting. While the boat tours we may have done were not operating, from everything we heard about high season and the massive amount of tourists, it was a small sacrifice for the quiet enjoyment we had of Dubrovnik. 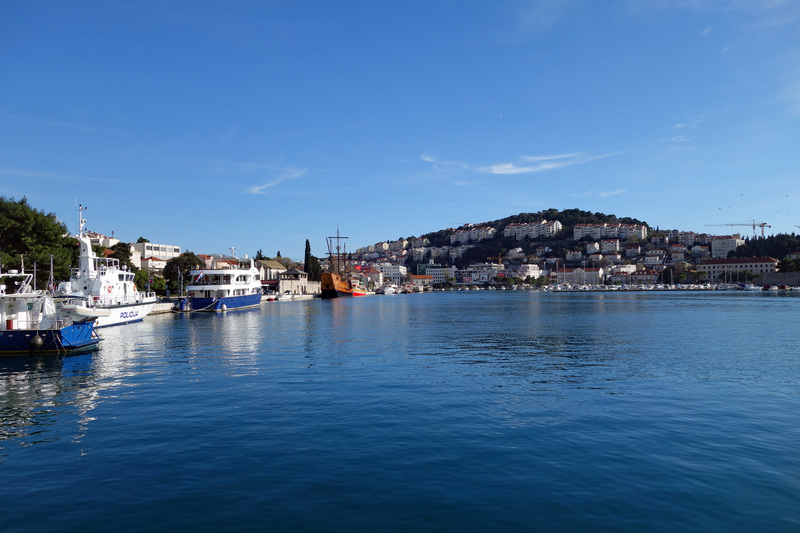 Now we are headed further up the coast to our second destination in Croatia, Split…..
We purchased a Dubrovnik Card for 7 days and by using this link to purchase online you save 10% off buying it in person at the tourist office. They have 1,3 and 7 day cards available. 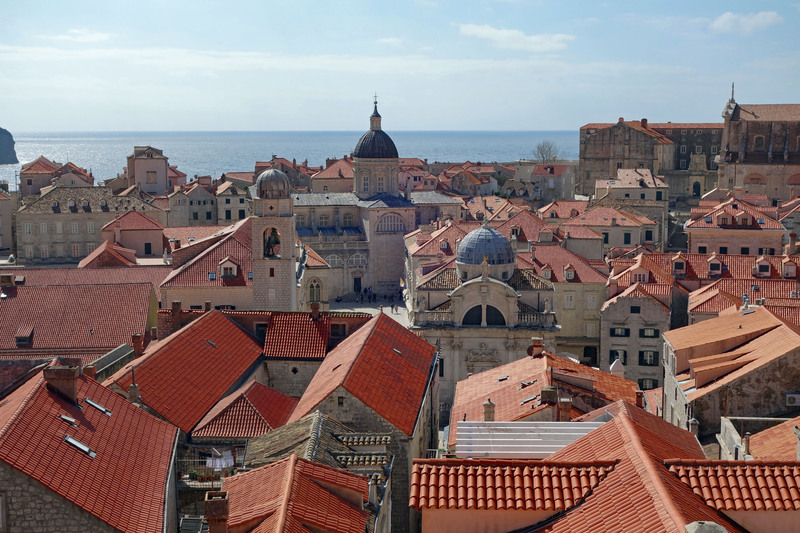 Beautiful….just like I remembered the old city of Dubrovnik (not so old as they rebuilt it after it was destroyed), although you have seen far more than we did. We were on one of those cruiseships! You will enjoy Split better. 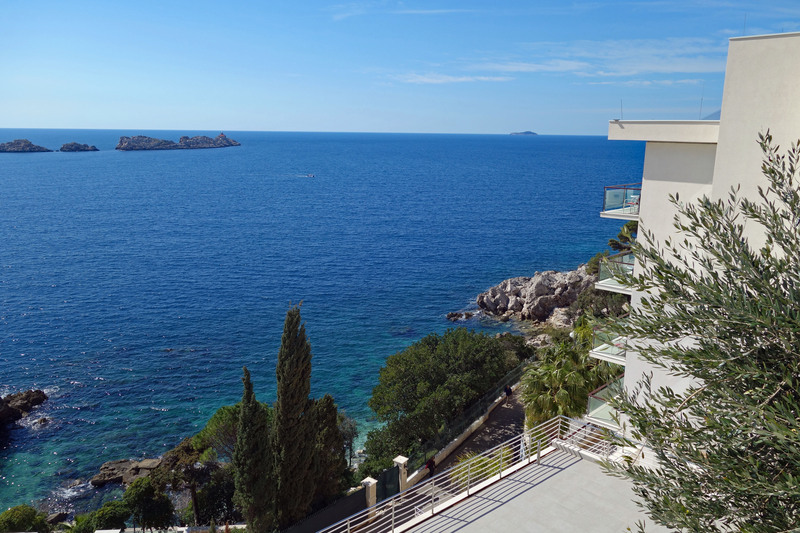 10 days in Dubrovnik was a nice length of time to enjoy a relaxed look around. If we had been here later in the season longer would be nicer so you could day trip to some of the nearby islands. Welcome! We are Blair and Susan, home free travelers since 1st of January 2018. This is our site to keep in touch with family, friends, acquaintances, friends of friends, new friends and whoever happens to land here. We hope you enjoy looking around to see where we have been and invite you to join us as we travel the world. All photographs on this site are mine, unless specifically noted.